Many of us are capable of much more than we realise. But not everyone achieves their true potential despite their best efforts and the efforts of others. 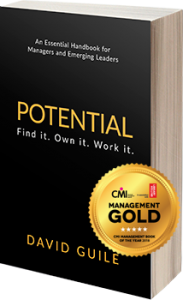 Potential by David Guile aims to give everyone the tools to fulfil their own potential and help others find it, own it and work it. Sign up here to receive the Matrix of Potential Framework and for regular leadership insights. ✓ Achieve more success in your career. ✓ Become a more effective and dynamic leader, for whom others want to work. ✓ Gain clarity in terms of what you want and how to achieve it. ✓ Enhance your positivity, self-belief and confidence. ✓ Take control of yourself and positively influence the future. Packed full with practical tools, Potential draws on David’s own experience as he worked up to CEO and board of the leading hotel group. Gain insight into your strengths and self-limiting beliefs. Get the best out of yourself, your team and your business. Define your purpose. What you want to achieve. What’s important to you. Embrace change and continually strive to grow and develop. Watch David talking about the Four Ps of Potential.